I think my lessons are fairly engaging. But the second that bell went – literally, the second – the students gathered to discuss their next plan of action. Their next build. Their next tutorial on how to use Red Bricks, how to rewire a city, how to build the underground plumbing system. It was then that I realized that the most authentic assessment I will ever get with regards to creativity, problem solving, divergent thinking, oral communication, thinking (etc.) 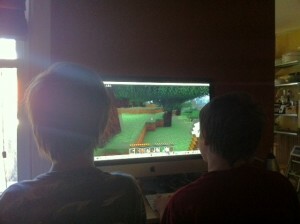 was during the lunch hour, when they were “playing” Minecraft. As a mother of two boys that use the Minecraft platform to build and design, I feel fortunate to have come into this classroom with a familiar knowledge of the potential of what this game can offer as it relates to learning, specifically around the concepts of STEM (science, technology, engineering and math). The last few years, watching my children play and learn has led me to interest in the relevance of game-based learning platforms and to the awareness of both the benefits and pitfalls. Included HERE are a few current articles and links about Minecraft in education, along with examples and pictures. In this video, a student demonstrates a world that he works on outside of school hours. The planning, thinking and co-authorship of this design and creation is at a level that I rarely see in the classroom. In fact, I can’t imagine anything that I could teach him to match the intricacy of thinking and design here. He incorporates math, science concepts, business, and art. He uses language skills to plan, think and communicate with his peers and spends hours reading and learning about servers, plugins and how to create his own Mods for game improvement. In the midst of all this, this same child reads about 2 – 3 novels per week. -> Three students will moderate and control the server. All students and other members are ‘whitelisted’ which will ensure safety, privacy and protection. -> Students will begin their first build – a school designed around the concepts of STEM and that will meet the needs of every single person (including teacher) in the class. -> Students will begin designing the “Light Rail System” and will investigate the current discussions about the issue – http://hamiltonlightrail.com/ This initiative will support the Geography, Social Studies and Language curriculum (Ontario). We welcome collaboration and hope that parents, community and other students tap into our Twitter Stream @dwcatalysts or instagram pictures as we document and share these experiences. 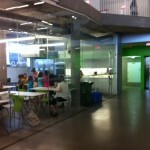 The learning environment is what will help create community. Before anything, students need to feel safe. Not just physically safe, but safe to learn how they learn, safe to think “outside the box”, safe to ask questions, safe to make mistakes, safe to be who they are. I recently read a post by Jackie Gerstein, a friend and mentor who talks passionately about the importance of community in the classroom (It’s About Connections Not Content). 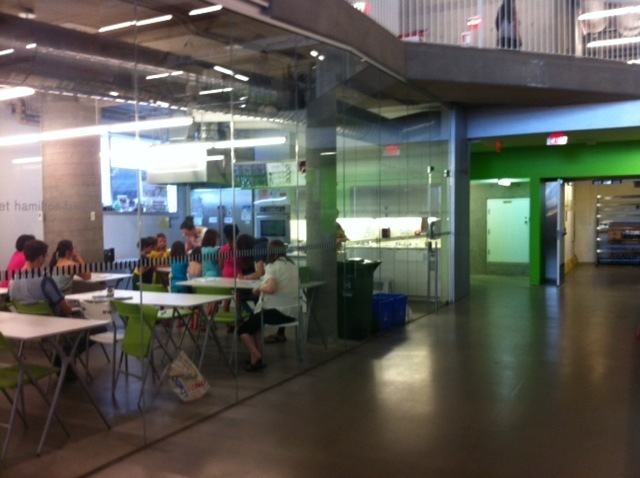 Below, I talk about the learning spaces to honour all learners. It is my intention to help these students find their passions, their gifts, and their understanding of themselves. Each day, we start off in a large circle. 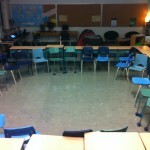 We might play a game, talk about a current event or gather our ideas for upcoming lessons. 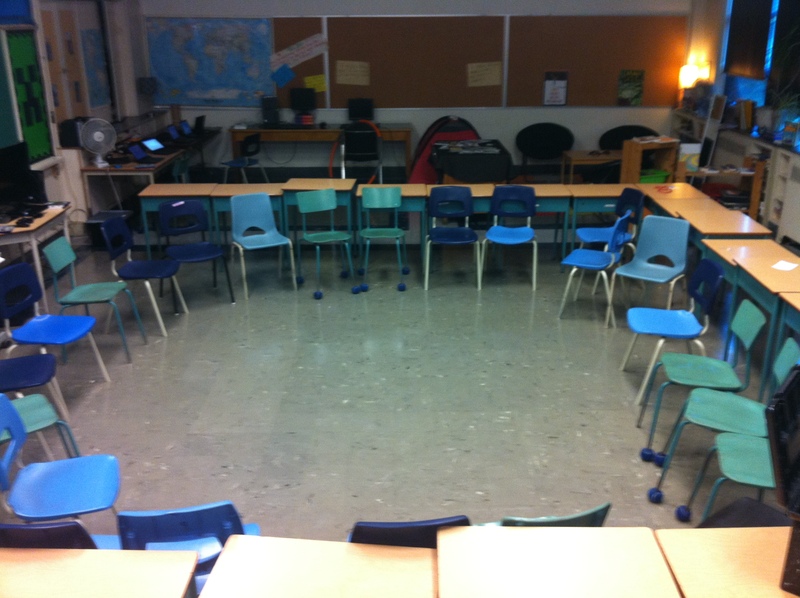 The circle gives brings the class together as one team, a group of co-learners and a support structure that they will need. 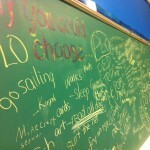 A few years ago, I taught in a brand new school with small classrooms. A quiet “comfy” space was not an option and was strictly forbidden by fire regulations. 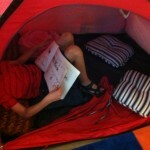 I yearned to provide my students with an area to go when they needed to unpack and reflect. As we know, this 7 hour day, surrounded by an assortment of individuals can be overwhelming and draining. This classroom (an older school) allows for this space. 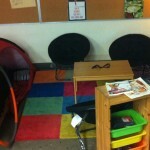 Students can use it to work collaboratively using the bulletin board or small table or even the floor as a workspace. Of course, reading a book, plugged into a good song is also pretty fantastic for any learner. It only took about one hour before a student crawled into this “getaway”. 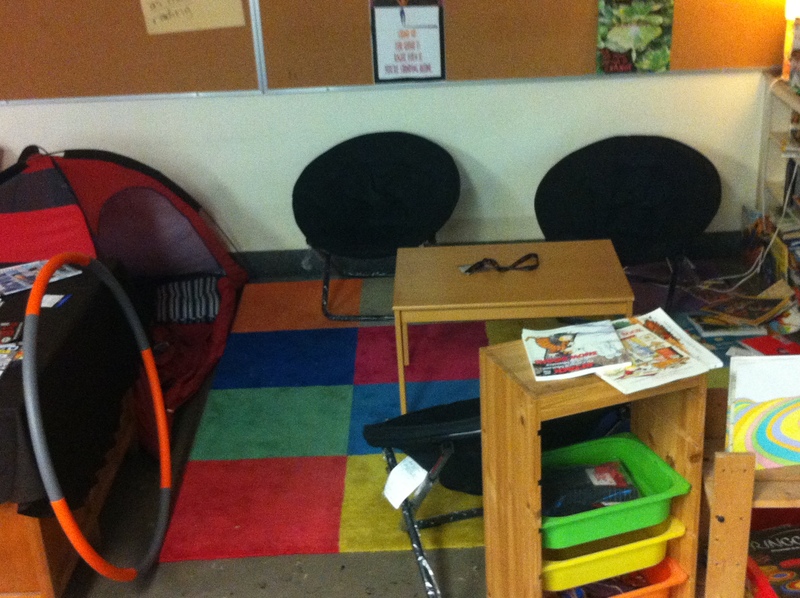 A calming environment that is still in the same room is a true gift for any classroom. I truly love to Hula-Hoop. Not only because it is great for the abdominal muscles, but the repetitive motion is soothing. After a long day, or a long think-session, there is nothing better then grabbing a hula-hoop, with a little music (or quiet is good too) and finding a place to gather thoughts and re-fuel for the next “thing” to come. 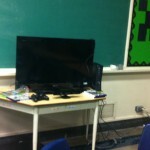 Another true gift that this classroom offers – enough space. 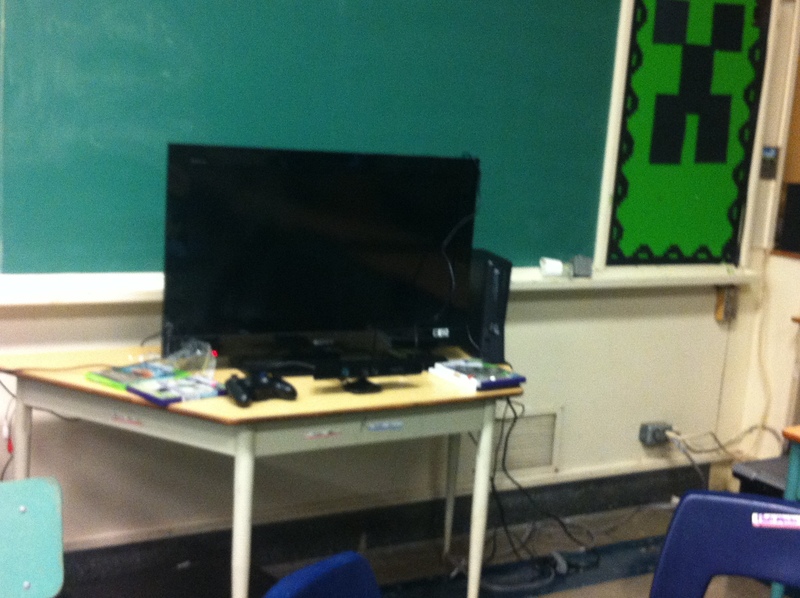 There has been much debate about the use of Gaming in the classroom and its integration into core subjects like math, social studies and language. 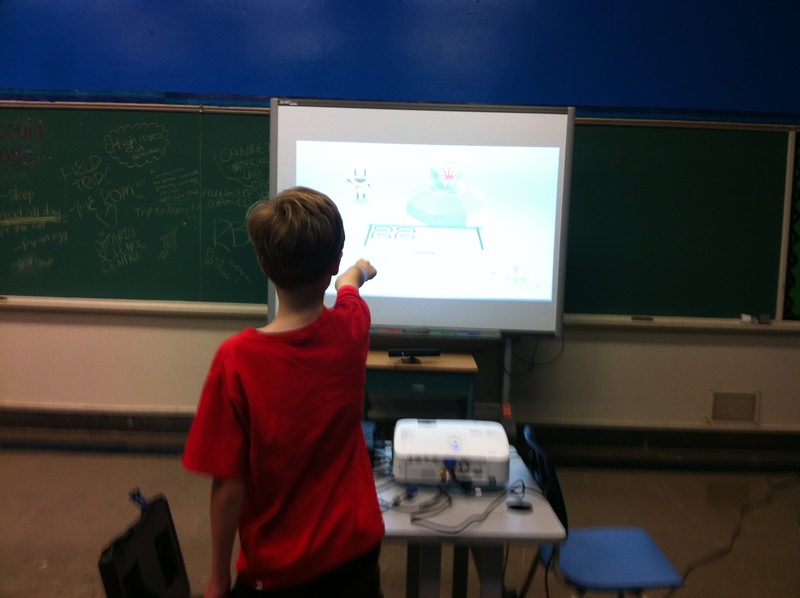 The Kinect offers an incredibly fun way for students to work together in solving problems, debating stories and characters, and thinking through puzzles and math games. Allowing students to move around, challenge one another and discuss the creation and process of the game itself is incredible insightful and meets them in their world. We will be integrating Minecraft in our classroom this year, as a way to plan, think, and discuss through creation and collaborative building. 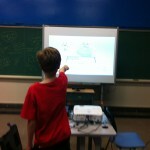 So often, we use the projector and whiteboard to deliver instruction and content. But with the Reflection App or Apple TV, students can broadcast their work and designs on a larger surface. To show the students a quick video, or demonstrate an iPad tool, I can stand anywhere in the room and broadcast quickly and safely. Even better, students can broadcast their work. Only a few years ago, I found myself stumbling trying to improve my motor skills when using the Smart tablet. One of my students asked, “Too bad we can’t just write on this table!”. I wonder if “Idea Paint” would work here. To move away from their desk workspace to a group workspace is valuable. It is also valuable to have an option to go back to ones own individual space. 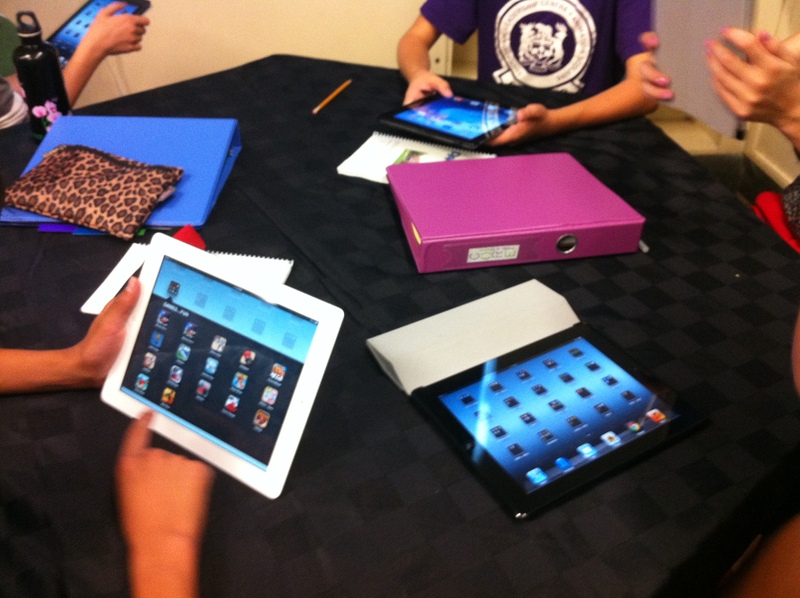 With the use of the HWDSB iPad program and the School iPad purchases, I have about 10 iPads in the classroom. We will start of with interview videos. A favourite app used today was WORLD OF SAND. I highly recommend it. Highly. 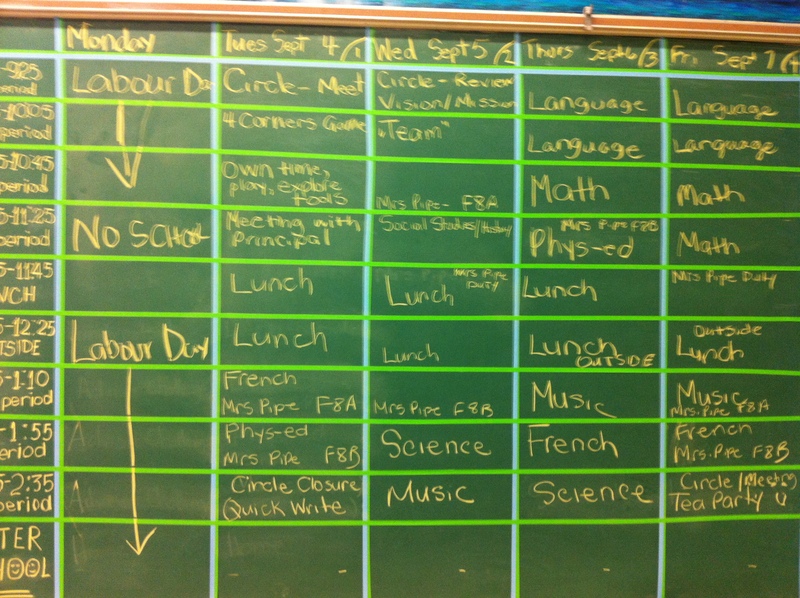 Weekly Schedule, Handouts and TEA. Posting a daily overview is important, but to see it in context within the entire week is essential. Like adults learners, our younger students want to know what is next and why, and especially how it relates to their learning. There is a definite accountability attached to this practice, but it is so worth it. At the end of the week, I brew tea and together we work on the next weekly schedule. It empowers them and gives them voice. This image keeps changing. As students become more comfortable with me – and more confident, they start adding more ideas and information here. 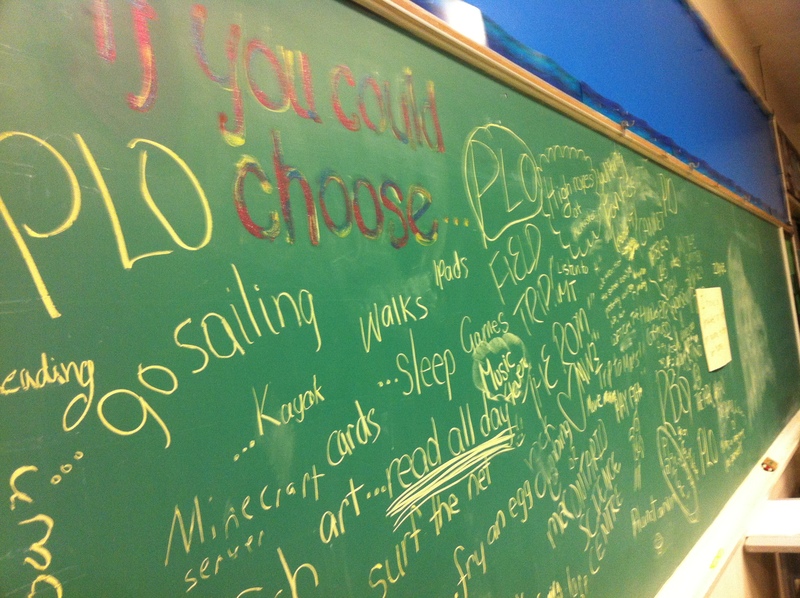 It is fascinating to see how many students ask to get away from the brick and mortar. They want field trips, walks, and to learn outside. Blended learning is not only going to provide more solid communication and on-going information for students and parents, but also more access to content and learning. While it might be surprising to some (ha, ha! ), I am not the bearer of all knowledge and information. Neither is the Internet. A blended learning platform (where students can also learn online) such as EDMODO (something new I’m trying this year) will allow me to facilitate content that is rich and diverse to a group of students that vary greatly in learning needs. As well, each student will be given a personal blog, and will have access to my daily plans through Google Docs and our classroom blog (another huge accountability risk that is worth the immense outcome). 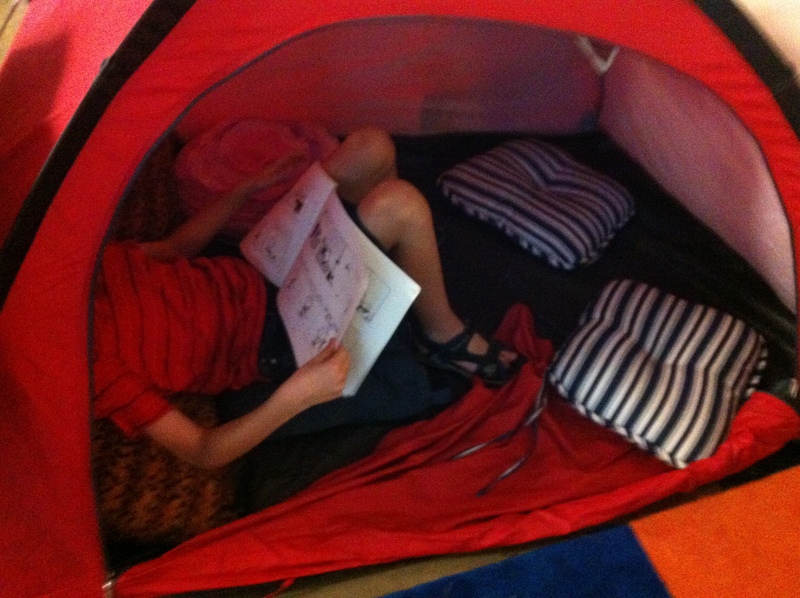 My favourite learning space – The real world. This year, I’ve established a partnership with the Hamilton Farmers Market where students will get a chance to learn stories of the lives of real Hamiltonians. Students will learn to shop, cook and share resources. Most importantly, they will have an opportunity to socialize and interact with citizens and with each other in authentic ways. 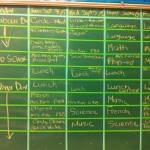 With some structure and guidance, they will have a chance to apply what they have learned at school to something real. We have also arrange for several community walks. Our school location is surrounded by hundreds of acres of forests (Royal Botanical Gardens) and wooded trails. The colours, smells, sounds and wildlife are the inspiration I’ll need when teaching poetry and creative writing. Perfect for finding space and time to talk, share and develop a real sense of self. Gaming and learning – are they connected? In 2010, I began experimenting with gaming in my classroom. 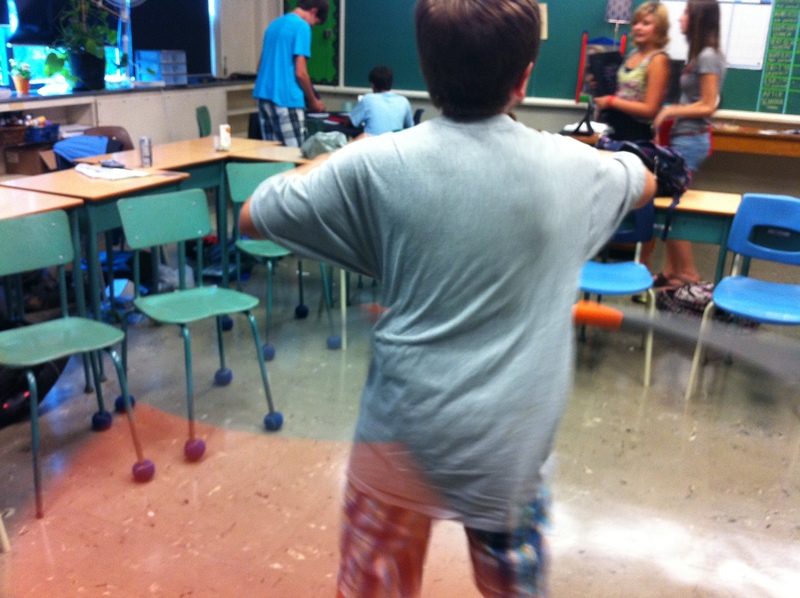 In my Grade Six classroom, ‘play’ wasn’t just about learning the facts and materials, but about creating an environment where they were most comfortable. Using Wii Olympics to have students virtually play participate in Luge or skiing events and then write down, sort, compare and analyze their scores helped them see an authentic reason why we sort data. Watching the little JK students exercise for 15 minutes a day using Wii Fit or Wii Sports (on those freezing cold mornings) was fascinating. 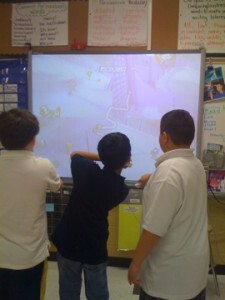 Using NikeRemote on our shoes, we used game to track distances when we ran 3 times per week to reach our marathon goal. I was only beginning to discover the potential for gaming and learning. Connecting our games with classrooms across the world was the most fun. Skype spelling and math games was an awesome way to end our week. For me it really isn’t about the game itself, but about engaging my students. They identified with gaming. It was my way to capture them, when we couldn’t explore outside, or build ‘hands-on’. “Imagine if we could give students a lesson they could take home and play? If they enjoyed the lesson they would be more apt to practice the material. 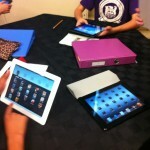 They could share it with friends and interact with people in their class online”. “It occurs to me now that my prejudice towards gaming was based on the belief that games were based solely on fun, and so in turn their educational usefulness must be minimal. How silly that was to assume that kids have to feel or even know that they’re being taught in order to learn something”. 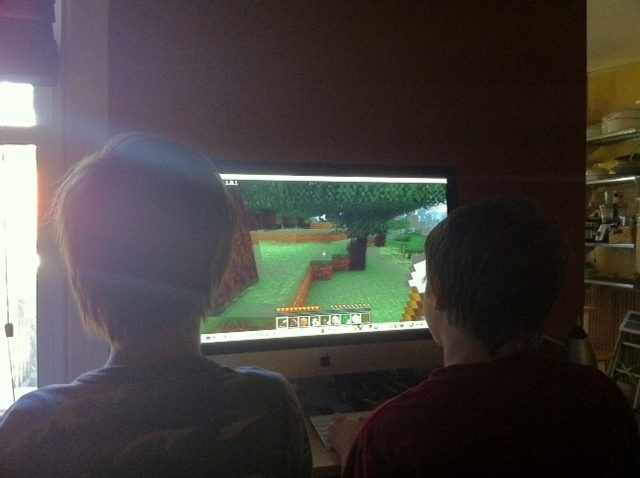 Shawn and Zack ‘s posts compelled me to ask my two boys (ages 9 and 11) if they saw any educational value in games (minecraft, wii, kinect) in the classroom or for their own learning. Their answer: No way. It is just for fun. And yet, on this very Saturday morning, as I read through the blog posts, my eyes wonder. I watch my boys plant crops near water, discussing a location that optimisms sun. I listen to them talk about the best way to ‘make’ paper so they can create books to put on the shelves that they created for the school that they designed. I listen to them talk about the formula needed to make ‘ink’ for their pens…….and then I spy, as they use they internet to find out facts about ink, paper mills and sugar. Then my 9 year old says…lets make a cake. They were using Minecraft. My eyes wonder to their unopened packpacks. I wonder, what homework they have. But, as they see it…it is play, not learning. So how do we connect the two? I think that both Shawn and Zack clearly make the point that there may be link between learning and engagement. But, maybe its something more? Do these games also help us with our critical senses? Do they encourage us to talk and problem solve? Do they encourage more divergent ways of thinking? I certainly do not fully understand the impact that gaming is having on my own children, but by reading about the projects and innovations that a few teachers are ‘action’ researching, my confidence in the use of the methods has definitely heightened. What kind of world they will want to play in. What kind of gaming experience they desire and what they’d like to accomplish. And I’ll try to figure out what other auxiliary projects they want to try while playing the game. Such as writing projects, making Let’s Play videos, modding the game… or who knows! I’m sure they will surprise me! It is very reassuring that in spite of tradition and set curriculum, teachers are still finding ways to incorporate new mediums into the classroom. Thank you Shawn and Zack for deepening my thinking on this issue.